Native Instruments’ Massive synthesizer uses a unique set of wavetable oscillators to produce sound. Some of the oscillators are self-evident: “Square-Saw” blends square and saw waves, and “Sine-Triangle” mixes a sine and a triangle. Others, like “Melofant” and “Strontium,” are more creatively named. Here’s a set of pictures showing visual representations of all of Massive’s wavetables: the left-hand image in each set shows the output when the “WT-Position” knob is turned all the way down, and the right-hand images shows what happens when you turn the knob all the way up. You can use these images to get a quick idea of what each oscillator sounds like, or to (approximately) recreate Massive’s oscillators in another wavetable synth like u-He Zebra. 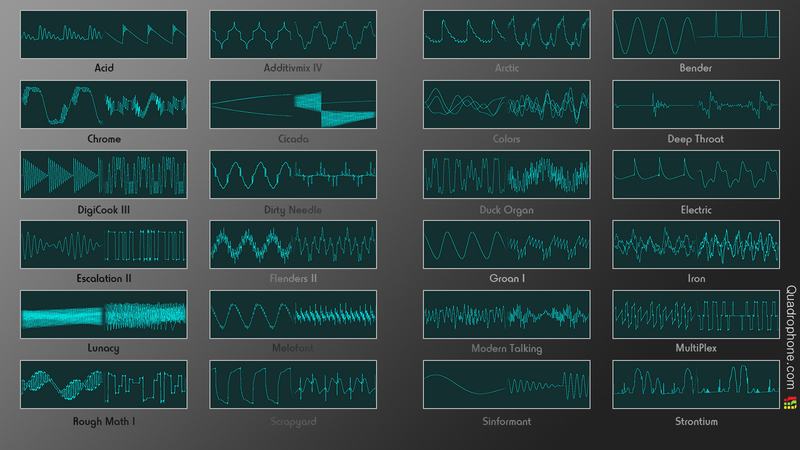 Download a 1600×900 wallpaper of some of the cooler-looking waveforms here. Many of Massive’s wavetables contain more complex evolutions than a simple crossfade between waveforms. Click on any wavetable image to see an animation of the waveform as the “WT-Position” knob sweeps from left to right. The animations are fairly large, so they may take a minute or two to load. Also check out the Massive: Essentials video tutorial for a look into synthesis with Massive, or just get straight to it with Massive: Dubstep Sound Design (get 20% off on both by using these links).